I thought that since it's the holidays, and everyone has favorite projects they've done in the past, we'd open Saturday's Artist this month to include all past Holiday projects. So if you have fond memories of something, or favorites you'd like to share, by all means link to your posts! To put in your link you'll just put in the address of your creative post, and make sure there is a link somewhere on that page back to O.L.M. 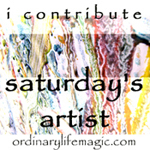 or Saturday's Artist. That's it! I'll play! Here's my blog about the holiday cards my daughter (age 12) and I made yesterday. We had such fun!